Oh, I adored Boy Meets Boy. I read it as quickly as I can, and it's such a fun, light-hearted read. The end is so very satisfying that I finished it with a huge smile on my face. It's such a sweet, quirky, romantic story. I loved Paul. I loved Noah. In fact, I loved all the characters. But especially Paul and Noah, and OK - Infinite Darlene. 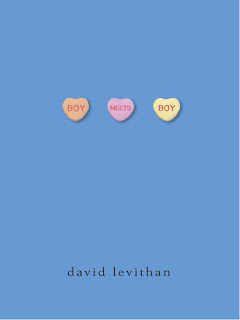 I love the world that David Levithan has created in Boy Meets Boy. A town where the Boy Scouts revolt at the idea of excluding gay people into their establishment and so become the more welcoming and accepting Joy Scouts instead. Where PFLAG becomes the hottest parent's group to rival the PTA. Where the cheerleaders at the high school are in fact bikers. The homecoming queen is also the star quarterback. The icecream parlour is called 'I Scream' and shows clips of horror films while you wait. Wouldn't that be a wonderful world to live in? Paul lives in this world, and has been openly gay since second grade when he comes out to his best friend Joni. He meets Noah in a bookstore and they start dating and oh my god, they are so cute together. But it can't be all roses all the time. Paul's confused ex-boyfriend keeps popping up, Joni starts dating a guy that everyone has problems with. And as easy as it has been for Paul, it's not so easy for his gay friend Tony, who lives in another town with strict religious parents. This is my second book read by David Levithan. And it won't be my last. I loved Paul's voice and his insights about high school, breaking up, best friends. Honestly, I'll hate to return this book to the library. I just added this to my library que! I think I will like it. This does sound like a great read and one that I will definitely be checking out. Great review!